Adds a bunch of information to the black bar at the top of the screen. Everything is fully togglable on/off through the in-game settings window. Latency text and icon coloured according to your current latency (with user defined thresholds). Your current FPS (Frames Per Second). Your current Pax Romana amount which can be clicked to show the tokens window. Your current coordinates in the game-world. Show White- and/or Black Marks. Show Friends and/or Cabal members online. Add-on Manager - see the description further down for information. Offset the items from the left and right. Adjust the transparency of the bar. Add drop shadow to the elements. Adjust the brightness of nearly all elements. Regarding the latency threshold values: It will be green up until the first value, yellow until the next, orange until the 3rd and above that red. Currently there's no proper value check, so if you for instance write a lower value in field 2 than in field 1 it will mess up. The values are given in miliseconds. NOTICE: Restart your client completely after installing this add-on. You should always do so when adding/changing .xml files. You will find a new menu item called "Add-on Manager" (near the bottom of the list) which will open the Add-on Manager window and from there you can select the "Topbar Information Overload" item to open the settings. Please note that add-on developers need to change their code to hook into this - it's not something that "just works." So if you want this to happen with your favourite add-on talk to the developer and let them know you want it to support the Add-on Manager in Topbar Information Overload. 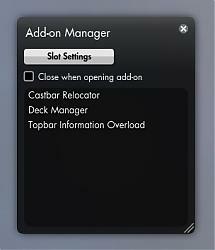 You open the Add-on Manager the way you used to open the Topbar Information Overload settings, it replaces that item in the menu. You can also Shift + click on Menu to directly open the Add-on Manager. Inside the Add-on Manager you will see a list of registered add-ons. If you hover over an add-on in the list a tooltip will appear with some information. If it has options you can click on the add-on in the list to open its option window. If it's slotable you can right-click or Shift + click the add-on in the list to open the slot picker. The slot picker will allow you to assign an add-on to any of the 16 slots in the topbar, so you can quickly access the functions setup by the add-on developer when clicking the icon. This is of course important for an add-on like Deck Manager, which would be a hassle to through the Add-on Manager to open it. If the slot is dark it's already assigned to an add-on (a tooltip will reflect this and inform you of which one), but you can of course overwrite it - it's merely an indicator. Likewise the slots will light up in the topbar as you hover over them in the slot picker. If you want to remove an add-on from a slot simply open the slot picker for that add-on and click the slot it's assigned to. In the Add-on Manager there is also a button for the slot settings as well as a checkbox which will close the Add-on Manager when you open the options for an add-on. 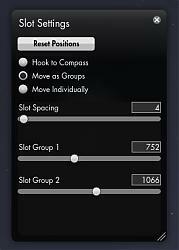 The slot settings window will allow you to configure the placement of the slots. Default they hook to the compass, which will give you the option of setting the icon spacing. You can also choose to move them as a group of 4 each, still allowing you to control the icon spacing. The last option allows you to freely move each slot to wherever in the topbar you want. Note that if you input a number in the input box it will only get saved if you confirm the change with return/enter while the input box is in focus (your text cursor is in it). Fixed spacing after black bullion. Added sprint icon, can be shown/hidden in the options. Fixed icon spacing issue that could occur in some cases. Bar slot icons now relocates with the bar if you change it to bottom alignment. Added the option to hide the GUI edit mode lock icon. Fixed positioning of some groups not being correct (ending up at the far left). You might have to reset the positions to fix this. Changed compass Y position check to allow for +/- 2 points in each direction. If you've moved it somewhere on the bar it might not be at exactly 0 on the Y axis. Changed how the compass' Y position is checked to hopefully prevent cases where it bar slot mode would wrongfully switch to group mode from compass. Changed so that if you reset bar slot positions and the compass has been moved and you're in group mode, it will populate the bar slots from the center of the bar. Added info text to the Add-on Manager window so people know to right-click an add-on in the list to open the slot picker. Added icons to the add-on list in the Add-on Manager to quickly show if an add-on has settings and can be slotted. Added item spacing option for adjusting the spacing between each item in the bar (excluding slots, they already have their own). Added option for how to show the menu button. It can now either be only the icon, only the text or both. Removed the ability to show/hide icons for currencies - they are now always shown. Changed the settings window to use newer code and it's also easier to navigate (more clear separation). The "Clear Unused Slots" button now aligns to the right of the Add-on Manager window. Cleared up the "Close window when opening add-on" text in the Add-on Manager window. Fixed drop shadow effect "growing" in some cases. Fixed so that if the compass has been moved (mainly if its vertical position has changed) and the slots are set to follow the compass, it will set the slot position mode to group instead. Fixed Add-on Manager, Bar Slot Settings and VTIO Settings window sizing bug that could cause them to "grow" when opened/closed multiple times. Fixed default width of Add-on Manager window to prevent it being resized smaller than the space it needs for the buttons. Added the edit GUI functionality. Added the pets menu item. Added all currencies as options (excluding coupons). Added so the currently selected add-on has its number in green in the slot picker. Fixed so it can properly be set to show at the bottom without issues (using the game's option for that). Fixed alignment issue with the latency icon (it was positioned too low in relation to the text). Fixed hiding latency text also hiding the icon. Fixed an issue with the Escape stack that would cause extra amounts of presses of Esc to get to the Escape functionality. The icon animation feature for add-on developers. The menu label/icon show/hide function. I will add those things soon. Fixed some left-over debug stuff that made part of the screen uninteractable. Sorry about that! Changed the menu icon/label checkboxes to a dropdown so you can’t actually remove both of them. If you’ve changed it to not show one you will have to set it again. Cleaned up the Bar Slot Picker window a bit. Unused slots can now be seen in the Bar Slot Picker window – they are shown with a redish number. This means that they’re “occupied” by an add-on that isn’t loaded. You can clear it by right clicking the slot if you want. 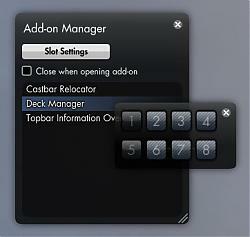 New button added to the Add-on Manager window to clear all unused slots. Basically this does what the above does, except it just clears all slots where you no longer have the add-on loaded. Added the new “Lockout Timers” menu item. Added new add-on bar slots so there’s now a total of 32. The “Menu” label can now be hidden. Aureus of Initiaion token amount can now be shown in the bar. Option window code has been updated. Fixed colouring of inventory space status not working. Option to show White- and/or Black Marks added. Extended compass check time and added a failsafe for slot positioning. The slot groups are now placed with the correct icon spacing between them. Add-on slot count increased from 8 to 16. Bar slot icon font changed to a more readable one at small sizes. Icons can now also be toggled on/off for: Menu, Pax Romana, Black Bullion, Inventory, Friends Online and Cabal Members Online. Colouring can be toggled on/off for Friends and Cabal Members Online. The alpha change when 0 friends/cabal members are online can now be toggled on/off. Friends and Cabal are now split into two separate groups in the options. Font size can be adjusted. The font Y offset can be adjusted. You can now add a drop shadow effect to the items. Mostly useful if you want to turn the bar transparency all the way down. There's also options added to control the drop shadow effect. Layout automatically updates when the lengths of Pax Romana/Black Bullion/Inventory/Friends Online/Cabal Members Online change (re-adjusts the elements to keep correct spacing). Adjusted the colouring of various elements. Reduced the inventory, clock and latency icon sizes to better fit with the rest of the icons. Options window scroll position is now saved across sessions. Switched download and mail icon positions. Almost all elements can now be dimmed using the new brightness option. Font style can now be changed without having to reload the UI. Changed some things regarding load order and such, which should make it more reliable in loading everything correctly. Optimised a few bits and pieces. Can now show online friends and cabal members. These are also clickable for opening friends list and cabal management. Icon added to the inventory readout, makes it more clear in the information overload (hoho). Fixed inventory not changing to red colouring when reaching 0 free slots. The latency colouring can now be set to smoothly transition between the colours for each threshold. There's no longer a dead spot between the icons and text where you can't click for the different clickable items. New options window with new groupings, labels, scrollbar, resizable and what not. A bunch of internal code clean-up, mostly related to building and positioning the different elements in the bar. Added a Black Bullion option. Added an inventory space option. Can show two different ways with an option for colouring when getting low: <=20 = yellow. <=10 = orange. 0 = red. A few very minor tweaks - like fixing accidently opening the character sheet when clicking at the top most portion of the bar over by the menu button). Adds support for the download icon introduced in 1.5. Able to switch between the old text style and the new one (that Funcom has changed to). Check the settings and reload the UI (/reloadui or Ctrl + Shift + F1) when you change it. Fixed display of latency when it goes over 1 second. A bunch of cosmetic adjustments to make stuff align bettter. Windows should no longer fail to load properly. Added the "Looking for Group" menu item introduced with patch 1.2. Added mail icon blinking introduced with patch 1.2. New auto-slot feature. Add-ons will now get slotted automatically the first time they register with VTIO, assuming there's slots free. This will also happen for add-ons you might have chosen not to slot on the first load of this new version, but after that it's all good. There's also FIFO feedback when this happens. Changes to how windows are created to possibly and hopefully fix the issue some people are having with them not being shown properly (it's not something I'm experiencing so I'm just blindly trying to fix it). Changes to the way default values are handled to hopefully fix window sizing problems reported by Eth. Fixed an issue where multiple add-ons could have the slot picker active. Updated readme.txt to better clarify some things. Updated developer information (http://tswaddons.wordpress.com/tio-developer-guide/) with an example file and also corrected function name typo reported by Gongju. Added right-click on an add-on in the Add-on Manager list to open the slot picker. Added onMousePress to list of functions supported for slotted icons (for developers). New Add-on Manager! See add-on description for details. Changes to how MainMenuWindow.swf and Viper_TopbarInformationOverload.swf communicate which hopefully eliminates the issue where the topbar is blank. Added ability to hide the compass. Added ability to set the transparency of the black bar. Updated for patch 1.1 - read the readme.txt for important information on how to install as it now uses a new structure. Fixed loading issues due to different load order for the modules, so you should no longer end up with an (almost) empty bar. Tweaked positioning of some icons and text for the OCD people out there. Fixed currency not always updating. Latency icon is now also forced to update and not wait for updates. New settings to set your own latency threshold for the colouring. Fixed items resetting their values and waiting for updates when zoning/porting/whatever. Added a left offset value option to offset the left items toward the middle if needed due to other icons taking up the space. Fixed settings window popping up every now and then. Fixed leading decimal points (as in removed them). 12-hour mode now also uses commas for the currency instead of periods. Loving this addon, thanks and keep up the good work! I noticed that sometimes the icons in the bar (relocator and deckmanager) will be alligned all the way to the left (between menu and pax amount) with only the relocator clickable, a reloadui will get them back to their assigned positions. I pvp (and die ) a lot so maybe it has something to do with the multiple respawns. Hmmm, that shouldn't be happening... I'll see if I can provoke the issue and figure out what's going on. I'll add it to the list, but don't expect it any time soon though. This addon have nearly all I want, except the player dimension. Is where any hope to see it in future versions? I briefly tried to add it, but it didn't seem to actually update its information so I ditched it for the time being. It's something I want to add, but right now it's not really on the top priority list (especially because it's a hassle to test). I used MainMenuWindowX, but there are performance issues with its DPS-meter, which I need only from time to time, and not as a part of top bar. I haven't any information about possible fix... so I decided to get your addon and try it. I'm the thing which not exist. Last edited by Rianon : 08-10-2012 at 03:25 PM. Can't get addons to save settings in between sessions. Last edited by TiaMaster : 08-05-2012 at 04:45 PM. Tswrp has a modules.xml too and one overwrites the other. I tried putting the modules code snippet before the tswrp code, and after it... all I get is a black bar. I have a menu button, but it doesnt bring anything up. You are editing XML files? You should not do that. Everything needed in terms of loading TIO is inside the Viper_TopbarInformationOverload directory and adding it to other files will make it not work. There no longer any xml files in customized or even any files (mods) in the default folder where they were put during the work-around period. I am only using TSWRP and the Bazaar mod. Last edited by FoxMaiden : 08-04-2012 at 08:49 AM. I tried installing your mod the new way, by putting all the files into the Flash folder, xmls and all. And I just get a black bar at the top with nothing on it. I even uninstalled my other mod (tswrp), and I still only have the black bar... I do have the menu item for this mod though. Have you cleaned up the old XML files located in \Customized\? If they still contain information regarding Topbar Information Overload it will cause problems.